Fodé Lassana Diabaté is a virtuoso balafon (22-key xylophone) player from Mali. The public is invited to join Lassana on April 2, at Cape Breton University’s Centre for Sound Communities Studio, on April 3 at Halifax North Memorial Library, on April 8, at Centre Communautaire Étoile de l’Acadie, on April 9, at Menelik Hall in Whitney Pier, and on April 13, at the McConnell Public Library in Sydney’s waterfront district. Additional programming will take place in Cheticamp. Thanks to Support for Culture and Cape Breton University (CBU), Lassana will be visiting Cape Breton Island in April for a series of public performances, school visits, and studio recording sessions. These interactive events are part of CBU’s Centre for Sound Communities community-based arts research project called “Songs and Stories in Celebration of the International Decade for People of African Descent.” The public is invited to enjoy the music and stories of Lassana’s traditional culture. Audience members will also be asked to share their own experiences surrounding songs and stories of their own communities and cultures. All ages are encouraged to attend. Lassana began playing balafon at the age of five with his father, a master balafon player. He has collaborated with international artists across a number of genres including jazz and Latin music, and was a member of the Grammy-nominated Mali-Cuba collaboration, Afrocubism. Lassana is also the leader of the group Trio Da Kali, a trio of Malian griot musicians who are revising forgotten repertoires and styles of the revered Mande griot tradition. Few can match Lassana’s lyricism and virtuosity, or the resonant sound of the rosewood keys of his balafons, which he crafts with his own hands. 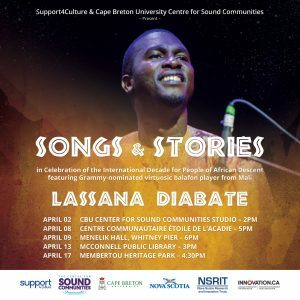 “Songs and Stories” with Lassana Diabaté will take place on April 2, at CBU at 2 p.m., on April 3 at Halifax North Library at 7pm, on April 9, at Melenik Hall at 6:00 p.m., and on April 13, at the McConnell Library at 3:00 p.m. On April 8 at Centre Communautaire Étoile de l’Acadie, the public is invited to bring a dish to a community potluck celebration at 5pm. For more information please visit soundcommunities.org. To schedule an interview please contact Dr. Marcia Ostashewski, Director, Centre for Sound Communities at (780) 264-7624 or marcia_ostashewski@cbu.ca.